Does winning matter anymore? When sports are considered more entertainment than competition; when seasons and playoffs stretch for so long in so naked a grab for revenue that the off-season feels like a week; when players make so much money that one game lost, one or two or three seasons lost, can't affect the way they live ... can winning a championship possibly have the same power? ¶ It's impossible to avoid thinking like this whenever you walk into a sports palace like Boston's TD Banknorth Garden. With plush carpets and a spread fit for Nero in the locker room, 104 luxury suites with whispering waiters and state-of-the-art, high-def scoreboards, it's not like the old Garden, smelling as it did like piss, smoke or your grandfather's shoes. Each detail declares its high-tech worth; you find yourself constantly thinking, That must've cost a ton. It all smells like money. ...much has changed since the 16th went up in 1986. The league, remember, was the hot young thing then. The commissioner, the dynamic stars, the young-turk execs, all were riding a phenomenon, a game that could displace baseball and threaten football in the national conversation. Then came the pop-culture breakout: Michael Jordan won his first title in 1991 with the Chicago Bulls, wept uncontrollably—charisma finding greatness finding humanity—and pro basketball had its unstoppable Elvis. As ticket prices climbed, though, so did the need for distraction, a sleight of hand to cover up how few players like Jordan there really were. NBA arenas became an even greater bombardment of spectacle after he quit: dancers, endless noise, pyrotechnics. Confirmation that the hoopla had consumed the hoops came in 2006, when the defending champion Miami Heat staged an over-the-top opening night celebration and lost to Chicago by 42 points. Now it looks as though even the venerable Celtics, one of the greatest franchises in sports history, will launch their own bit of wretched excess with Queen's schlock anthem. But then something odd occurs. As Freddie Mercury starts his shriek, old Celtics faces—calm, composed as if they hear no music at all—march in, single file. There's John Havlicek holding the Larry O'Brien Championship Trophy, trailed by Bob Cousy, JoJo White, Tom Heinsohn, M.L. Carr, Satch Sanders and Cedric Maxwell. "Like the ghosts of Celtics past had been summoned," guard Ray Allen says later. And it's true: Each championship era is represented, and the representatives beam as they close in on the 31-year-old man at center court. There stands Paul Pierce. The Celtics forward, once the seeming embodiment of what Jordan sneeringly called "New Jack players"—underachieving and self-involved, persona non grata with the national team after leading it to its implosion in 2002, bearer of a contract that will pay him $18,077,903 this season—is hunched over. He's a wreck. Havlicek hands him the trophy, and Pierce dips his head onto the legend's right shoulder. Pierce lifts his head, tears streaming down his cheeks, and it suddenly becomes clear that we're witnessing a rare moment in modern sports: not market-tested, not spun, close to pure. The greats circle Pierce, hugging the captain who erased 10 years of questions by leading Boston over its archrival, the Los Angeles Lakers, in the 2008 Finals, the man who went head-to-head with LeBron James and Kobe Bryant and outplayed them, revealing himself as a winner. It is a welcome. "For Havlicek to pass that to him?" says Celtics forward Kevin Garnett. "That was a generation passing it down, saying, 'You're finally one of us. You're a made person.'" Pierce raises the golden prize above his head and shakes it at the crowd: 19,000 throats bellow. He glances at the trophy, shakes it again, cheeks shiny and wet, mouth gaping; the man can barely breathe. He sets the trophy down on a table and staggers off. But it's not over. When Pierce walks back out minutes later to receive his ring, he's still weeping, and he files down the line of league and team execs saying "Thank you, thank you" to each. He hugs his coach, Doc Rivers, and general manager Danny Ainge and, after helping raise the banner, turns on his heel and burrows into the crowd. He finds his mother, the woman who raised him alone, and gives the ring to her. Lorraine Hosey kisses her son. "You've waited your whole life for this," she says. And maybe that's it, why Pierce is carrying on in a way his family and friends have never seen before. Jason Crowe, his best friend for 17 years, had never seen him cry, not after heartbreaking high school losses, not after one of their teammates was murdered, not even after Paul himself almost died. So many of the important people in Pierce's life are here tonight: Uncle Mike, who raised the basket in the driveway where he learned to play; his idol and half brother Steve Hosey; the high school coaches who served as the father he never had. Even that man—the dad—he's here, too, though he's not, his absence the same massive presence it has been since Pierce was very young. This can't be real, Pierce thinks as he makes his way to the bench. His teammates are on the court, shooting warmups, but he sinks into a chair. He blows out his cheeks. "Get it together," Pierce says out loud, and then a fan yells, "Do it again, Paul!" and he drops his head into his hands. No: It happened. It really happened. When Pierce looks up, his eyes are red. He tugs on his right knee brace. He rubs his hands into his face. And that's when you know: yes. Winning can still matter, still trump coin, comfort and cheap fame. The next question is why. Twice his life, men have left Paul Pierce in profound pain. It's too glib to say that's the reason he is a champion today, but being a victim has provided him a unique fuel. He's also been given great ability, especially to probe other men for weaknesses and beat them in a very public way—victimizing them, no less—and the tricky part is figuring out which is more important, the ability or the fuel. Pierce doesn't give a lot of clues. He's about as easy to read as an Easter Island monument. "There can be a fire going on all around him," Crowe says, "and if you look at his face? You won't know." But Pierce may not know either; pain can breed complications, a lifetime of inner conflict. That's why, though stunned to see him so emotional, those in his camp understood. He is a basketball player, after all, whose ambivalence toward his sport can be summed up by the tattoo he commissioned two years ago for his left forearm, the one depicting a knife plunging into a basketball and framed by the words MY GIFT, MY CURSE. Pierce keeps that covered on the court with a sweatband, but if you're looking—and he wants you to look—know that in what should be his season of supreme contentment, of peace at last, Pierce has a miniature version emblazoned on the side of his game sneakers, complete with the initials MG/MC. Whenever he hits the court, Pierce is literally a walking contradiction. So, yes, it makes perfect sense that in an era when stars bounce city to city, Pierce emerged in the Celtics' shakiest era as their one constant. It makes sense that his college coach, Roy Williams, can speak about Pierce's ferocious desire and then talk of throwing him out of practice for wearing "that casual, careless, it-doesn't-mean-that-much kind of look." Or that Pierce, who early on undermined Rivers by snarling, "Why the hell'd you take me out of the game?" for all of Boston to hear, revered Red Auerbach, treasuring each foul cigar the Celtics patriarch slipped him as if it were made of gold. And that, of course, may be the most delicious contradiction: Paul Pierce sitting with Red, beginning a career that now ranks as one of the greatest in the franchise's history. Because growing up in Los Angeles, Pierce hated the Boston Celtics. For the longest time his vision of the future was tinted purple-and-gold, and it wasn't just a dream of basketball. It was the dream NBA life that a 14-year-old boy saw when he'd sneak into games at the Forum in Inglewood or see the players' sweet rides parked outside the gym at Inglewood High, where they sometimes practiced and where Paul would become a star. Paul would worm his way into some of those practices, too, trying to glimpse the collective spark igniting that high-octane offense, the blinding passes. Magic, Kareem, Worthy: They were winners, those men, deep-voiced and cocky. They had such a presence. Pierce didn't have that at home. As a kid growing up in Oakland, he had Steve Hosey and another half brother, Jamal Hosey, eight and 14 years older, respectively, and for a time they filled the dad role. Chubby and feisty, Paul hated to lose any game. In kindergarten, he'd survey their awards and declare, "I'm going to have more trophies than both of you guys put together." But when Paul was eight, Steve got a scholarship to play baseball at Fresno State, and Lorraine moved to L.A. with her youngest son to be near her ailing mother. There she scouted out coaches and pastors who could make good role models, and made sure Paul became more than just another kid to them. There was an uncle who kept him in line, and another to take him to play in the grown-men games on Saturdays at Athens Park. But Lorraine worked as a nurse and, though she made sure to drive her son to every practice, when extra shifts came open, she'd grab them, and at dinnertime Paul would be making noodles in an empty house. He was on his own. You could feel the longing. George Pierce never lived with Lorraine. Paul was no more than six the last time he saw his dad. Cornelia Pierce, George's wife, answers the phone at their home. She's cordial but has little desire to open old wounds. "I'm a strong woman," she says. "I've prayed over it and I've accepted the whole situation; in fact, I watch many of Paul's games. I feel that Paul is an innocent bystander, as well as I am. I'm a Christian woman, so I look at things from the positive side and I don't have any regrets, or any attitude or anything. George and I have been married for 45 years." Paul and Lorraine moved to Inglewood in 1988, and that year Jamal Hosey saw George Pierce one last time. "I yelled at him, 'You know, you got a great kid! You at least could call him, you bum!'" Jamal says. "Then my wife pulled me, and I walked away." Sprawled beneath the jet paths of the L.A. airport, hardscrabble Inglewood didn't expect much of Paul Pierce. When at 13 he announced that he wanted to be a garbageman, his middle-school teacher replied, "That's pretty good." But he was also studying those Lakers and playing ball every chance he got. Briefly sent down to junior varsity in his sophomore year at Inglewood High, Pierce was the team's star by season's end. The next year he was one of California's top recruits, turning up for classes still sweaty from the 5:30 a.m. sessions run by assistant coach Scott Collins, a local policeman. "If it was making a pass, getting a rebound, the last-second shot? Whatever it took to win, that was Paul Pierce in high school," says Inglewood High coach Patrick Roy. "He was everywhere." Pierce went off to Kansas in 1995 and led a talent-rich team that went 69--6 in his final two seasons. Now that NBA dream life was close. He left school after his junior year, sailed into the 1998 draft hearing talk that he could go as high as No. 3, yet when the day came, Paul sat unpicked as future journeymen Michael Olowokandi, Raef LaFrentz, Robert Traylor and Jason Williams skipped up to the podium. The Celtics snapped him up at No. 10: more fuel for the furnace. That fall Pierce practiced jumpers while shouting out the names of every player taken ahead of him. "I've always been the Rodney Dangerfield of this game," he says. "Maybe it was meant to be that way, but that always drove me. If somebody said, 'You're going to be the Number 1 pick, you're going to have a great team around you all these years'? It would've been too easy." It didn't take long to prove himself. He and Antoine Walker became one of the league's top-scoring tandems, and if the 6'7" Pierce was not your classic aerodynamic swingman, opponents still found his first step impossible to stop, his shot nearly unblockable. He rebounded, swatted away shots; by his second season Pierce was among the league leaders in steals. But most unusual, perhaps, was his sense of calm. Pierce never seemed rushed, no matter how frenetic the pace. "One of the best tempo scorers I've ever seen," says Rivers. "He just puts the defender on a string all night. They're dropping, off-balance ... but he's always balanced." After the games he could play too. Pierce liked bars and clubs; he was known to get together with friends and have a time, and off-season nights in L.A. could stretch till dawn. In his early college years it wasn't unusual for him and Crowe to bolt a club at 3 a.m., grab a bite and then head to Manhattan Beach to sprint the sand hills. "Play basketball, chase girls and have fun," Crowe says. "And do each with the same aggression." It didn't let up when Pierce moved to Boston. "He was competitive in everything: a game of H-O-R-S-E, a game of cards, an evening out," says Orlando Magic forward Tony Battie, a former Celtics teammate. "We'd get together and hang pretty rough and party pretty hard, but he would be the first one in the gym in the morning, talking smack. You'd get in at 9 o'clock and think you're early, but Paul was there at 7:30. He'd out-party you, then get his lift in while you were still sleeping off the night before." On Sunday night, Sept. 24, 2000, Pierce had just returned home from dinner with Steve Hosey in Boston when Battie called. Paul hung up and told his brother he'd be back soon. Steve was in town from California; the two would be playing in a golf tournament the next day. Hosey went to his room, began sorting through the clothes he'd wear on the course, when a voice shot through his head: You're not golfing tomorrow. Hosey shrugged it off. The feeling rolled through him again. He looked out the window, checking for snow or rain: nothing. He got into bed, turned off the light. Twenty minutes later he sat up, unable to shake the sense that something was wrong. Such a thing had never happened before, so he got on his knees to pray. He didn't know why. It was just past 1 a.m. on Sept. 25 when Pierce, along with Battie and Battie's brother, Derrick, arrived at Boston's Buzz Club. What happened next took mere minutes: The Batties veered off for the men's room, Pierce strolled through the pool room. When he leaned down to talk to two women, a man stepped forward and said, "That's my sister." Pierce said, "No disrespect," and tried to backpedal. "Next thing you know," he says, "all hell breaks loose." A champagne bottle crashed against the side of his head, and a swarm of men descended, punching, stabbing, windmilling blows from all angles. At least two blades flashed. One sliced three times into Pierce's abdomen, with one jab slicing his diaphragm, puncturing a lung and plunging to within a half-inch of his heart. By the time the Batties emerged from the men's room, security guards had dragged Pierce to a stairwell. Blood streamed from six gashes on his face. He noticed his shirt was wet, peeled it back and saw his wounds, put his hands on them "to hold the blood," he says. He had been stabbed five times between his shoulder blades, too. He didn't know that, though, until the Batties had gotten him into their car and were weaving through traffic to get him to a nearby hospital. In the emergency room, Pierce kept asking, "Am I going to live?" He was extraordinarily lucky. The surgeons were able to operate using minimally invasive instruments and didn't have to open up Pierce's chest. But for the once-mighty Celtics it still felt like another bewildering blow; the sudden deaths of Len Bias in 1986 and Reggie Lewis in '93 had crippled efforts to rebuild in the post--Larry Bird era. The Red Sox had their Curse of the Bambino, but Celtics stars were finding it hard to stay alive. Pierce stayed just four days in the hospital and was back playing three weeks later, but some of the wounds weren't physical. Once an outgoing, almost clownish presence, Pierce kept to himself at home; the Celtics arranged for a 24-hour guard there. He talked with fewer and fewer friends and family members as the months wore on. "It really messed me up in the head," he says. "I saw a shrink, a psychiatrist, a couple of times and I was like, 'You know what, man? I don't want to talk to you no more; this is bothering me.' I didn't feel comfortable." A year after the stabbing, Pierce went to a tattoo parlor in Venice Beach and tried to reclaim his body his way: with a massive ink job across his back, over the five purplish wounds. It was his own design—the hands of God holding his heart, with wings and a halo and the words CHOSEN ONE unrolling below. Pierce removes his shirt, steps under a spotlight in his living room, points. "When they were going over all my scars, some of the marks right here?" Pierce says. "They were hurting still." But when, in September 2002, it came time for the trial, Pierce was not the star witness the prosecution had hoped for. By the time Pierce took the stand, two key witnesses had already recanted their grand-jury testimony. Pierce had identified one of the three defendants—William Ragland, Trevor Watson and Anthony Hurston—while in the hospital, and ID'd another two weeks later, both through photographs. But at the trial assistant district attorney John Pappas lost confidence that Pierce could provide a positive identification of his assailants on the witness stand. So Pappas didn't ask. It wasn't a total flip, says former Boston federal prosecutor Paul Kelly, now the NHL Players' Association head, but "anybody with a sense of the system—lawyers, police officers, court officials—we all knew somebody either got to these witnesses or fear overtook them and, frankly, Paul Pierce." Pierce laughs at the idea, pointing to the six-year contract extension he agreed to as he awaited the start of the trial. "If I was scared," he says, "why would I re-sign with Boston?" He says that he simply couldn't be sure the men in court were the same ones who stabbed him. The club was dark, the attack fast and furious. The jury acquitted all three men on the charge of armed assault with intent to murder; Ragland was convicted of assault and battery by means of a dangerous weapon and sentenced to a seven-to-10-year prison term, Watson was convicted of assault and battery and sentenced to one year, and Hurston was acquitted of all charges. Pierce declined to make a victim-impact statement at sentencing. He was alive. He just wanted it all to go away. Still, one memory remains vivid. In the days and weeks after the stabbing, Pierce wondered if the gruesome news might finally be enough to flush his father out. Each day Paul would sift through the messages and supportive letters from strangers, fans, friends. "I'm here: I could've died," Pierce says. "And to never get a phone call or a letter from him? That really hurt me for a long time. I was like, Man, he didn't even reach out or nothing. That hurt me to where I was, like, If he dies? I don't even care." And that NBA dream life: Where was that, anyway? Winning titles like Magic's Lakers? Pierce had three straight losing seasons in Boston, and his own slick-haired coach, Rick Pitino, scurried back to college a failure. Hitting clubs? Being famous? It had nearly killed him, and it laid bare in nightmarish relief the flip side of being a pro athlete, what Pierce calls his "curse." Riches and adulation, of course, he had figured on. But with it came a new responsibility to care for family and friends, "all the stress that comes with you finally having money," he says. Pierce was sure his stabbing had grown out of "the jealousy, the envy" that comes with celebrity. All that was puzzling enough, but now, after his best season yet, after Pierce had led the Celtics to the 2002 Eastern Conference finals, even his game was being called into question. It's not that Pierce didn't work. He'd show up to practice at all hours, even on off days. One night during the 2001--02 season then Celtics coach Jim O'Brien looked down from his office and saw Pierce on a treadmill, "and I don't mean jogging: I mean sprints," O'Brien says. "He's completely drenched. I said, 'What the hell you doing?' And he said, 'There are no days off.' That's who Paul Pierce is." It's not that he lacked toughness, either.No one could scoff when Shaquille O'Neal dubbed Pierce the Truth. New Celtics CEO Wyc Grousbeck knew that in 2002, when he saw Pierce play on after the Phoenix Suns' Amaré Stoudemire knocked out two of his teeth and the bloody pieces slid across the Garden floor and stopped at Grousbeck's feet. But when measuring greatness, it all came down to the word win. Celtics great Kevin McHale sniffed that Pierce "couldn't carry Larry Bird's jock," and after Pierce led the U.S. to a sixth-place finish at the 2002 world championships—with coach George Karl benching him against Argentina and sitting him in the fourth quarter of the final game against Spain—the notion gained currency. Suddenly Pierce was tagged as selfish. "Paul and I? It was obvious at the end that we were battling," Karl says. He'll say only that Pierce wasn't always "committed" to areas beyond scoring and tended to force "his personality on the game. And when that happens, the game has a way of slapping you." The slaps kept coming. In 2003 Pierce had his first playoff triple double in the second round against New Jersey and led Boston in postseason assists and scoring. But the Celts lost to the Nets, and when Ainge took over as general manager that May, he unloaded Walker. "He didn't think highly of me and Antoine at all, and I knew this," Pierce says. "So I'm already thinking, He's not feeling my game; I don't need to try to build a relationship because he already doesn't like me and just traded Antoine. Maybe I'm next." Pierce wanted to play for the U.S. again at the 2004 Olympics, but his reputation was in tatters. Roy Williams, an assistant on the U.S. staff for those Games, tried for two years to convince his colleagues that everyone had gotten Pierce wrong. "I was the only guy bringing his name up," Williams says, "and it wasn't getting anywhere." His sell wasn't made any easier by Pierce's demeanor. The stabbing, the trial, the losses, the selfish label—all of it combined to drive Pierce further into a shell. There were times, Battie says, when he'd see his friend sink into "his own zone, his own little space" where no one was welcome. Paul stopped calling everyone in the family except Lorraine; his mother would implore him to phone his brothers, and Paul would say yes. But six more months could pass without a call. After the stabbing, Pierce was warming up for a game against the Golden State Warriors in Oakland when someone from the stands called, "Hey Paul! I'm Billy!" Pierce glanced up. It was his half brother Billy Pierce. And Billy is certain that he heard Paul call back, "My brother?" Then George and Cornelia's son came down courtside. The two men had never met. Billy told Paul that he had called the hospital when Paul was convalescing. He asked if they could speak after the game. Paul says the pregame meeting "could've happened," but he doesn't remember. Maybe Billy misheard, or Paul was distracted or inclined back then to write off anyone named Pierce. But when the horn sounded at game's end, Paul ran into the locker room without looking back. Billy says he wants no money. He has a good life as a truck driver, and his kids' favorite player is Paul Pierce. "I'm the only child," Billy says. "I had a sister who passed away as a baby, and the whole time Paul was in Oakland, I was like, I wish I could see my brother. But ... bad situation, I guess. "I love my brother. I would love to know my brother. If he doesn't want to know me? O.K. I would wish at least he and our father can sit down and have some closure. Because I have kids, by two different mothers, and one thing I have learned? I will not allow my kids to grow up the way me and Paul grew up—not knowing each other." Doc Rivers took over as Boston coach in 2004, and for half of that season he and Pierce clashed. The Celtics were rebuilding and had used three first-round picks to bring in Al Jefferson, Delonte West and Tony Allen. Rivers wanted Pierce to trust his young teammates more and stop playing his ponderous isolation game. Trust? With a championship looking ever more distant, Pierce didn't trust Ainge to get the winning players the team needed and didn't trust Rivers's approach. Boston's first-round playoff loss to Indiana in 2005 put another dent in Pierce's image. After getting ejected from Game 6 for throwing a retaliatory elbow with 12.9 seconds left in regulation, he peeled off his jersey and walked off the court at Conseco Fieldhouse waving it. Auerbach, the Celtics' eminence, called the display "embarrassing." It came as no shock to hear, on draft night two months later, that Ainge was close to dealing Pierce for the rights to rookie guard Chris Paul. When that deal fell through, it looked like star and team would be stuck in one of those bad NBA marriages. But during the two awful seasons following 2005, Pierce never tuned the coach out. Rivers kept waiting for Pierce's supposed selfishness to kick in, but "even though it wasn't working—and he was fighting it—he was still trying to do [what was needed]," Rivers says. "That's not a selfish person." The team won just 24 games in 2006--07, and late in the season Pierce told a Boston reporter, "I'm the classic case of a great player on a bad team, and it stinks." Yet such foot-stomping had become more exception than rule; Ainge, Rivers, his brothers Jamal and Steve had noticed that, as Pierce says, "my spirits really changed." He had been seeing a woman named Julie Landrum since '05, and Pierce credits her with teaching him to think more positively and "keeping me happy." Out for nearly half the '06--07 season with injuries, Pierce watched Boston lose a record 18 straight. He realized that, at 29, he was as far as ever from winning a title, and his first impulse was to publicly demand a trade. Landrum talked him out of it. Instead, in a midseason meeting with Ainge, Grousbeck and managing partner Stephen Pagliuca, Pierce calmly ran through the options: trading him to a veteran team, rebuilding around young talent. 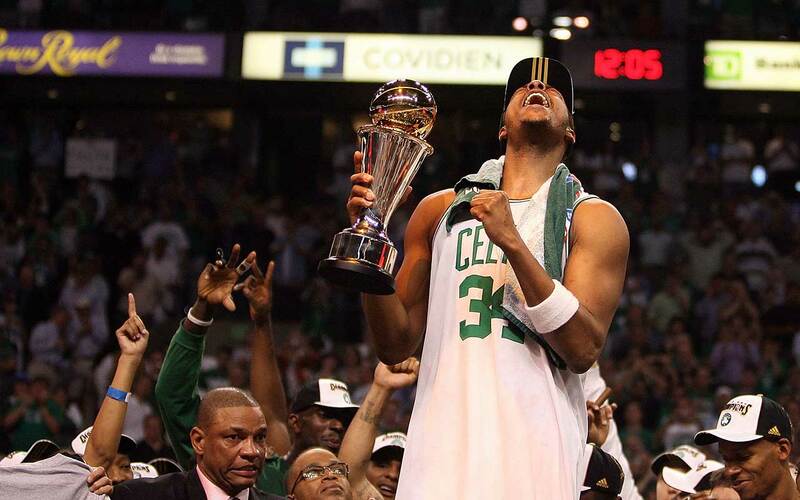 Grousbeck insisted he wanted Pierce to retire a Celtic and would pay to build a winner. "I believed them this time," Pierce says. "I thought, All right. I finally heard it from the horse's mouth." Proof came only when Ainge engineered the trades, in June and July 2007, for perennial All-Stars Garnett and Allen. This is your opportunity, Pierce thought. Don't let it go to waste. Any fear that he wouldn't be able to share the ball, the stage, dissolved. "First day of camp, you knew: He wanted to win so bad," Rivers says. When George Pierce returns the call, he speaks briefly, says he has watched his son play on TV. He has just one photograph, taken when Paul was four or five. George remembers that he was supposed to pick Paul up once, but he had to work and didn't show. George says he's had his ups and downs, and "some things that shouldn't have happened did." It's not clear if he's talking about his relationship with Lorraine or Paul or the fact that he never spoke to his son again. "Why don't you do this," George says. "Why don't you get ahold of him and have him call me?" The Celtics bolted to a 30--4 start, and anyone could see that Garnett and Allen had freed Pierce. He had carried the scoring load for so long that his all-around game now came as a revelation. With Garnett's presence enabling him to gamble on the defensive end, and Allen's outside shooting providing a payoff for his passes, Pierce took the fewest shots of his career and had the season of his life. He averaged 19.6 points, 5.1 rebounds, 4.5 assists and 1.26 steals. He made the All-Star team for the sixth time. He began changing minds. "What I saw was commitment," Karl says. "If the game said, 'Be a defender'? He was a defender. If the game said, 'Be a rebounder'? He was a rebounder. If the game said, 'Be an orchestrator'? He was an orchestrator. He made his career scoring points, but last year? What the game asked him to do, he did." Pierce missed his first game of the season on April 4, when Landrum, now his fiancée, gave birth to their daughter, Prianna Lee. He cut the umbilical cord, changed diapers and came back even more motivated. Boston struggled to eliminate the Atlanta Hawks in the first round of the playoffs, and the pressure mounted as Cleveland came next. Pierce and Garnett shared the scoring burden as the Celtics and the Cavaliers split the first six games, but the plan for Game 7, Garnett says, was: Get the ball to Paul Pierce and get the hell out of the way. Pierce didn't wait. He stole the ball from LeBron James on Cleveland's first possession, setting the tone. The two traded impossible baskets all afternoon—James scoring 45, Pierce 41—but it was Pierce's dive to beat James to the tip of a jump ball with one minute left that sparked visions of Bird's 1987 pickoff against Detroit. It was Pierce's killer free throws with 7.9 seconds left—the first one bouncing high off the back of the rim like Don Nelson's prayer in 1969—that sent James home. Then, in the deciding Game 6 of the Eastern Conference finals against the Pistons, Pierce scored 12 of his 27 points in the fourth quarter at Auburn Hills, and Boston came back to win, and the whole time he looked more alive than anyone had ever seen him. Pierce grabbed Rivers in a hug at series' end. "Thanks for sticking with me," he said. Pierce's performance in the Celtics' dismantling of the Lakers in the Finals sealed the transformation. In Game 1 he left the court with a knee injury, but he returned to hit two three-pointers and give Boston the lead for good. In Game 2 he led the Celtics in scoring and held off L.A.'s desperate comeback with two key free throws and a block on Sasha Vujacic's three-pointer. With Boston down 18 at the half of Game 4, Pierce demanded that Rivers let him guard Bryant, then dogged the Lakers guard relentlessly, blocked one of his jumpers and held him to 6-of-15 shooting, and the Celtics fought all the way back to win and take a 3--1 series lead. Pierce, the Finals MVP, would outplay Bryant again in the next game and Boston would win in six, but the championship—and Pierce's legacy—was secured in Game 4. George Karl is 57 and has seen the greatest, from Russell to Jordan, produce the kind of basketball that can make a coach swoon. He was in the building for the Celts' miraculous comeback and saw it up close. "Probably the best half of basketball I can remember one player playing," Karl says. Paul Pierce knew that many observers figured he would spend the off-season celebrating in Vegas, getting fat and happy with last summer's win. And yes, he did his share of partying. But despite Rivers's orders not to come back to town till camp opened, Pierce returned a month early, nine pounds lighter, his body more toned. "He came in the first day," Garnett says, "and the man looked like he was on steroids or something. You know what I'm saying? He's committed. He was telling me, 'I'm ready.'" The night before the opener, Pierce drove the seven minutes from his house to the team's empty training center and spent an hour drilling alone. "My time to zone in and see the game the way I picture it," he says. "My way." Then he went to dinner with the dozen or so people he had flown in for the ceremony, and Steve Hosey saw him hovering over his baby and fiancée, and edged over to hug him and tell Paul how he couldn't feel prouder of the journey he had made. But it wasn't over. Pierce has proven himself, and he's enough of a player to pound his chest about it; when people asked this summer about Kobe, he would say, "I think I'm the best player in the world." But somewhere along the way, he felt this ... shift. A championship had always been the goal, the way to quiet critics and tell the thugs they'd only made him stronger and, maybe, show that man what he had missed out on. But in the months after, Pierce found that he enjoyed how others—his brothers, cousins and uncles—enjoyed his success more than he did. He found himself feeling that his time in the delivery room, seeing his daughter born, was better than winning it all. "It was unreal," he whispers. It made him decide some things. "I don't want to be the dad that my father was," Pierce says. "I want to see my child grow. Who knows if I would've made it if he had been involved? Who knows if I would've been that much better? Who knows? But I'm sure his influence wouldn't have hurt those times I fell off my bike or didn't have nobody to rebound for me. I want to be there for my daughter—when she falls, to pick her up. When she needs help with homework." For the first time, too, Pierce feels ready to reach out to his father. "I want to at least contact him and talk to him," he says. "I think now, as a man, I can swallow whatever his reason was to not be there. Right now, I feel like talking to him and asking him, Why?" Told that George Pierce had asked him to call, Pierce pauses, says, "Oh, yeah? Did he really?" Offered the number, he says, "Sure ... I do want it. I do," and then he repeats the digits back, slowly, to make certain he's gotten them right. Then he takes Billy's number. When Pierce arrived at the Garden for the opener, he carried with him one of Auerbach's cigars. He placed it in his locker, where he plans to leave it until the season's last day, when he'll smoke it after Boston wins title number 18. Then he walked out and received the trophy crying and gave a speech to thank the people who raised him, and all the coaches and relatives and friends cried, too. It made the long wait seem right. "Because we know he can appreciate it," Steve said moments later. "Sometimes young guys can't. But he can; he's there. It's the right time. It doesn't get any better than this." But down on the floor, the ceremonies were over and LeBron James and the Cavaliers were trying to spoil everything. Emotions spent, Pierce and the Celtics trailed by seven at the half, and who would've blamed them for losing? Then Pierce snapped his team to life, starting the third period with a three-pointer, hitting another to answer a James jumper, scoring 11 to spark a 24--13 run that put Boston up for good. The Truth had beaten King James again: That's how the sports shows would play it. But something about the comeback, the whole night, resisted the usual reductive hokum. Nicknames are kids' stuff, really, and aren't much good at summing up complicated struggle. The truth? He swallowed his tears and got to work. Paul Pierce got through another hard night, and he's had enough of those to be called a man at last. Some would call that winning, too.